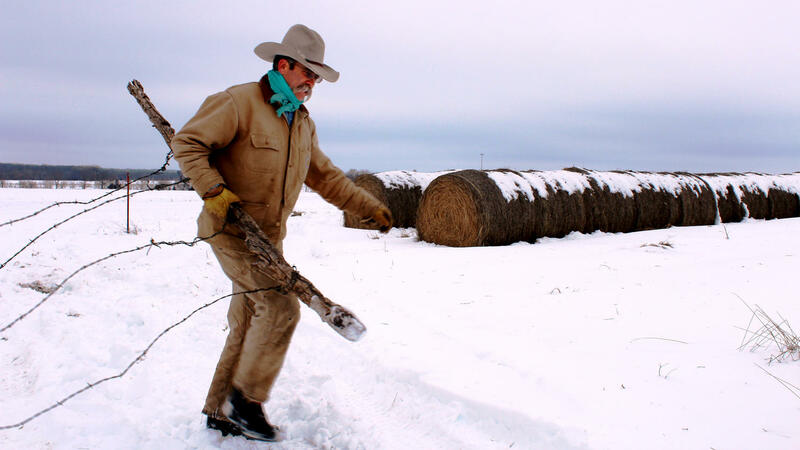 Kirk Sours says heavy snow creates extra work on his ranch, but he's thrilled that the pending melt will bring his otherwise dry pastures much-needed moisture. An extended drought and significant snow cover have forced Sours to buy expensive hay for his cattle. Imagine that your job is taking care of some 450 cows and almost half of them have either just given birth or are about to — all out in a pasture that has seen 2 feet of snow fall in less than two weeks. One thing you need is an old ax, like the one farmer Kirk Sours carries down to a frozen pond. He's covered in layers of heavy canvas work clothes, with a big gray mustache and cowboy hat to match. "Keeping the ponds open so they have something to drink. This pond's in pretty decent shape," he says. "I've got 16 dry ponds on the ranch." The drought here, near Tonganoxie, Kan., started last spring and hasn't let up. Drought had baked the soil here to bone-dry dust. "Our pastures here, a lot of it, looks dead when the snow's gone," Sours says. So Sours has been forced to buy scarce and very expensive hay. And now, with snow covering what grass there is — and the cows rapidly turning out other little mouths to feed — he's using much more. "[I] like to keep a lot of extra hay out, to give them a dry place to lay, during the night," Sours says. "And especially if they want to lay down and have a baby sometime, they've got a nice dry place to do it. It gets expensive, yeah." But for all this, Sours is pretty sweet on the snow. That's because the snowmelt will start to quench these dry pastures. "It makes for a little harder work, but in scope of the drought, man, we're just almost giddy about having this snow," he says. And if you think Sours is happy with the weather, you should call a Kansas wheat farmer out west, where the drought is now entering its third year. "I was beginning to wonder ... if it could rain," says Scott Van Allen. He hails from Kansas' Sumner County, which proudly boasts that it's the "Wheat Capital of the World." The snows brought the first real moisture to Van Allen's wheat crop since he planted it last fall. "This was the first time I haven't minded going out and shoveling my sidewalks off," Van Allen says. "I had a smile the whole time I was doing it." Jim Shroyer, a wheat expert at Kansas State University, says he is asked all the time whether the storms broke the drought. "No!" he answers. "But it sure as heck helps. It's better than a sharp poke in the eye." Shroyer says it's been so dry for so long that it would take 8 feet of snow to bring soil back to normal in western Kansas — where "normal" is pretty dry. So the snow wasn't so much a lifesaver for the wheat crop as a stay of execution. "This wheat crop is going to be going hand to mouth, from this point on," Shroyer says. Meanwhile, back at the ranch, the tires on Sours' huge four-wheel drive pickup are slipping a little. "Yeah, when you get this truck stuck, you're stuck," he says. The snow is melting now, and this ranch is going to get very messy. "I have learned one thing over the last 35 years of doing this," Sours says. "That you don't cuss the mud. I'd much rather have mud than dust." And for now, after the snow melts in Kansas, mud it is. Next month? Maybe green. Frank Morris reports for Harvest Public Media, a public radio reporting project that focuses on agriculture and food production issues. 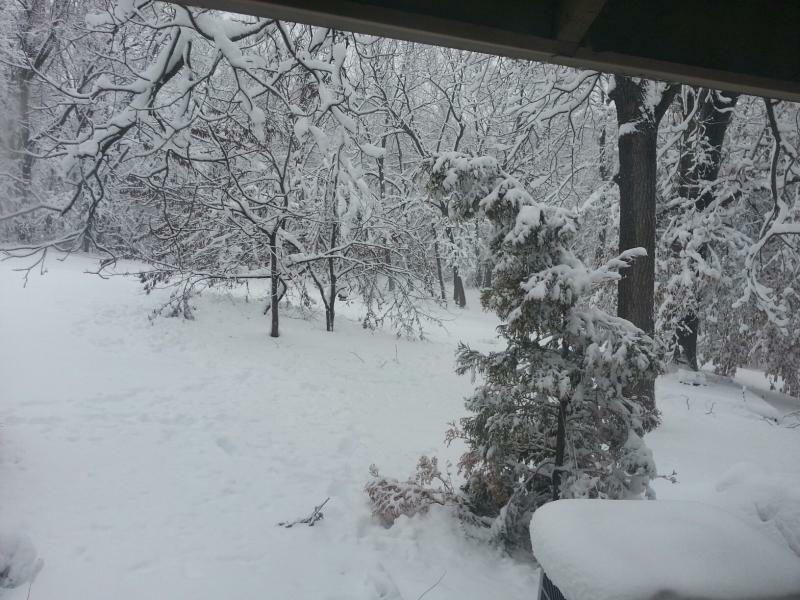 Recently, two big, rapid-fire snow storms hit Kansas, dropping more than two feet of snow. They caused thousands of accidents and all kinds of hardships. And yet, the storm also produced some big smiles. That's because, as we hear from Frank Morris of member station KCUR, blizzards can be a blessing in a place as drought-stricken as Kansas. 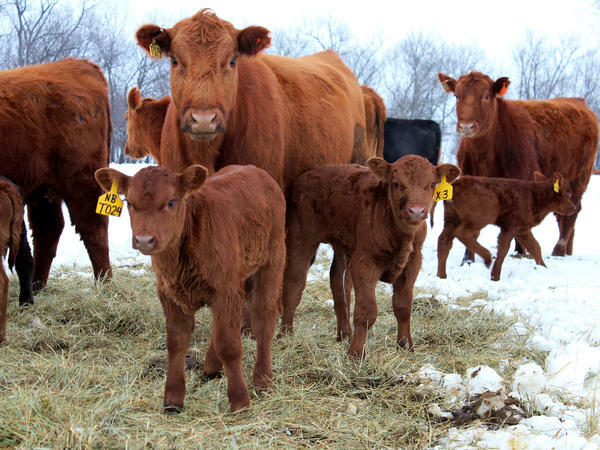 FRANK MORRIS, BYLINE: So imagine that your job is taking care of some 450 cows and almost half of them have either just given birth to calves or are just about to out in a pasture where 2 feet of snow has fallen in the past week and a half. One thing you need is an old ax, like the one Kirk Sours carries down to the frozen pond. KIRK SOURS: One side's the good side and one side's the ice side. MORRIS: Sours is covered in layers of heavy canvas work clothes, with a big gray mustache and cowboy hat to match. SOURS: Yeah, we're just chopping some ice, keeping the ponds open so they have something to drink. This pond's still in pretty decent shape. I've got 16 dry ponds on the ranch. MORRIS: And that's most of them. The drought here, near Tonganoxie, Kansas, started last spring and hasn't let up. SOURS: Our pastures here, a lot of it, looks dead when the snow is gone. MORRIS: Drought had baked the soil here to bone dry dust. So Sours has been forced to buy scarce and very expensive hay. Now, with snow covering what grass there is, and the cows rapidly turning out other little mouths to feed, he's using much more. SOURS: I like to keep a lot of extra hay out to give them a dry place to lay, during the night. And especially if they want to lay down and have a baby sometime, they've got a nice dry place to do it. It is expensive, yeah. MORRIS: But for all this, Sours is pretty sweet on the snow. SOURS: It makes for a little harder work. But in the scope of the drought, man, we're just almost giddy about having this snow. MORRIS: Because the snow melt will start to quench these pastures. And if you think Sours is happy, you should call a Kansas wheat farmer, one out west, where the drought is now entering its third year. SCOTT VAN ALLEN: I was beginning to wonder if it could rain. MORRIS: Scott Van Allen hails from Sumner County, Kansas, which proudly boasts it's the Wheat Capital of the World. ALLEN: This was the first time I really haven't minded going out and shoveling my sidewalks off. I had a smile the whole time I was doing it. MORRIS: Because the snows brought the first real moisture to Van Allen's wheat crop since he planted it last fall. Jim Shroyer, a wheat expert at Kansas State University, says he's asked all the time whether the storms broke the drought. JIM SHROYER: No, but it sure as heck helps. It's better than a sharp poke in the eye. MORRIS: Shroyer says it's been so dry for so long that it would take 8 feet of snow to bring soil back to normal in western Kansas, where normal is pretty dry. So the snow wasn't so much a lifesaver for the wheat crop so much as it was a stay of execution. SHROYER: This wheat crop is going to be going hand to mouth from this point on. MORRIS: Meanwhile, back at the ranch, the tires on Kirk Sours' huge four-wheel drive pickup are slipping a little. SOURS: Yeah, when you get this truck stuck, you're stuck. MORRIS: The snow is melting and this ranch is going to get very messy. SOURS: I have learned one thing over the last 35 years of doing this, that you don't cuss the mud. I'd much rather have mud than dust. MORRIS: And for now, mud it is in Kansas, after the snow melts. And next month? Maybe green. For NPR News, I'm Frank Morris in Kansas City. CORNISH: You're listening to ALL THINGS CONSIDERED from NPR News. Transcript provided by NPR, Copyright NPR. Whether you're lining up to vote or hitting the slopes, the snow will affect your day Tuesday. This snowstorm brought the added burden of power outages, so wet and heavy it tore down trees and lines. There was a heavier snow on the south side of the metro. Kansas City area residents have fought their way out of a second major snowstorm in less than a week. Some areas got upwards of a foot of new snow.